We decided to go for Thai food today for lunch and my lunch mates ordered something that is entirely new to me - mieng kham. Checking it up in Wikipedia, mieng kham can be interpreted as meaning "eating many things in one bite". This is from miang means "food wrapped in leaves" and kham means "a bite". 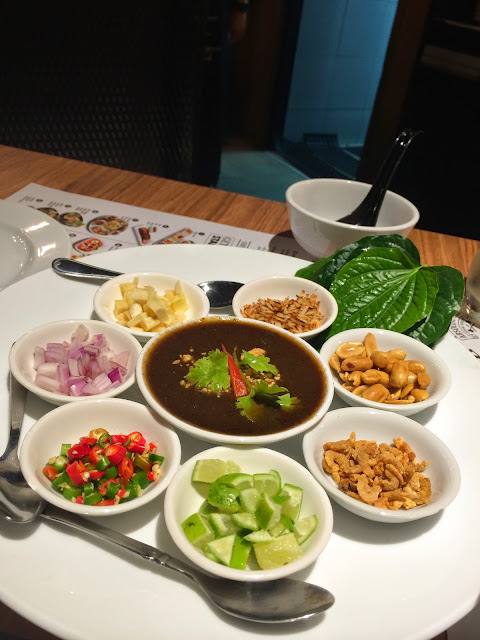 The dish was served with roasted coconut shavings, ginger, shallots, bird's eye chilli, lime with its peel (which was surprising for me), dried shrimps and roasted peanuts, topped with a yummy sweet sauce, all wrapped in a betel leave. I first tried it without the bird's eye chilli, thinking I may not be able to withstand it. But I gathered up some courage and tried it with, it tastes really, really good. Which I found surprising, since it did not look so appetizing on first look. But I think I am hooked.